My motivation for aftermarket race clip-ons, as a road rider, was simply to be able to alter the position of the bars. Specifically, as I am a somewhat taller/broader rider, I’ve always found OEM clip-ons and Helibars track-stars for that matter, have too much pull-back which in turn creates an overly acute wrist angle when hanging off. This is particularly bothersome for me because I’ve had a significant wrist/arm fracture in the past and a subsequent surgery to fix things. Whilst massively improved, I still have to be mindful of my left wrist. 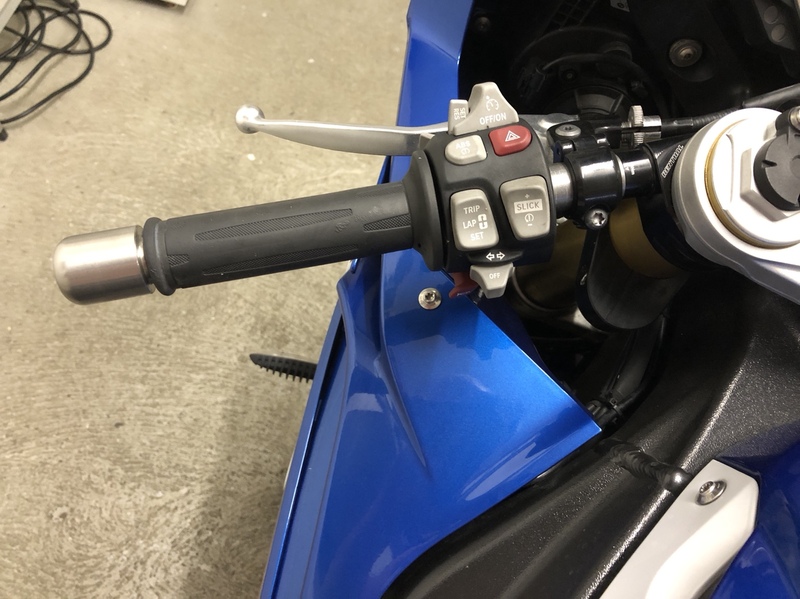 There’s somewhat limited information online about how to properly setup sport bike ergonomics, most of the time people say it’s just trial and error, which is true in some respects, but there is a definite method or school of thought to proper ergonomics which make the process more logical and structured. To that end, two particularly useful resources I’ve found are good old Dave Moss (https://feelthetrack.com/how-to-hand...ol-ergonomics/) and Dan Netting of Life at Lean (https://lifeatlean.com/the-benefits-of-rearsets/). So, following from Dave’s advice on proper clip-on positioning, I confirmed the OEM setup had too much pull-back. Furthermore, from my time using the Helibar track-star clip-ons, I found one attribute I liked was the reduced drop as this facilitated leverage in my experience. I’ve always liked Renthal as a brand, and have always appreciated the design of their race clip-ons, and after discussing matters with @baz I decided the Gen 3’s would be ideal for two reasons. No 1, they are not affected by the recall (kind of important lol) and No 2, they mount “inline” with the forks, as do the OEM and Helibars. The benefit of mounting inline as opposed to in front of the forks (as is the case with most race clip-ons) is that it allows a wider clip-on placement for a given amount of lock (this will make more sense in due course). Now, one issue which you will encounter when deviating from the OEM setup is clearance issues. Despite what might, at a glance, look like a subtle change, is in reality quite a substantial deviation from the OEM setup. Specifically, when reducing the pull-back you will have clearance issues with the front fairing. To resolve this issue you must use steering lock stops, or bump stops as they are often known. Essentially, these limit the amount of steering lock by providing a physical barrier on the frame. This is an important piece of crash protection in their own right, but in the context of clip-on positioning it is the reduced steering lock which prevents the clearance issues. So, problem solved ... not quite ... there’s a second issue which we run into by doing this, and that pertains to the steering lock and insurance. Good old insurance companies eyy! The problem we run into is that with reduced steering lock the OEM steering lock becomes unusable as you can’t reach the required amount of lock in order to activate the lock. The solution to this problem is to modify the steering lock so that it can be activated at reduced lock, i.e. sooner. One final issue is that race clip-ons do not accept the threaded OEM style bar end weights. This was a real shame as meant I am no longer able to use the excellent Positive Vibes bar ends from @GixxerChuck. I’ve looked into Universal bar end weights and the best option all things considered (weight, country of origin and attachment type) are the Oberon Performance large universal bar end weights. These use an expanding metal “thing” lol to attach to the inside of the clip-on, the benefit of which is rock solid fitment and “supposedly” better dampening performance. I’ve used these bar ends for a little while now and I have to say the performance is very good. I can ride all day without any vibration related hand issues using these bar-ends. That being said, if you are using OEM bars, or Helibars and have no intention of changing, I’d whole heartedly recommend the Positive Vibes. Oh and one minor thing to be aware of, is that the clip-ons must be drilled to secure the switchgear. 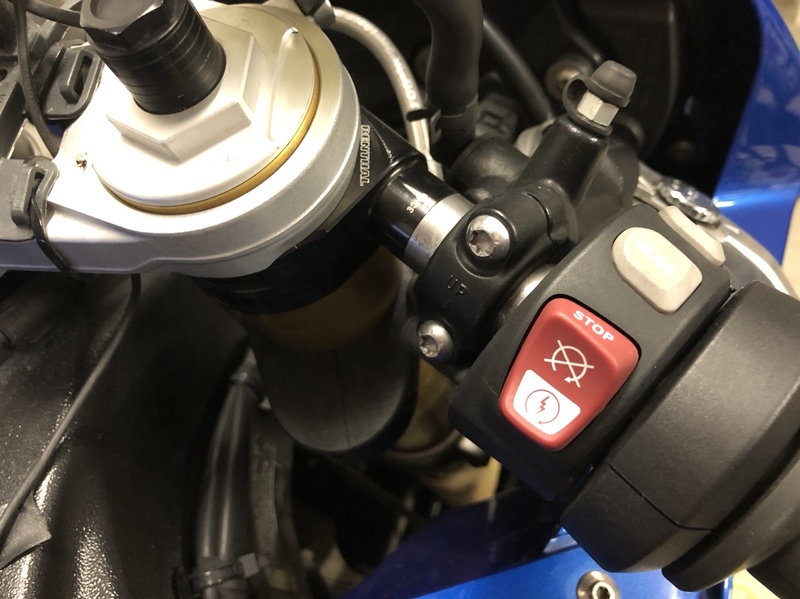 There are warnings from Renthal saying “not” to drill, but it is standard practice to drill aluminium race clip-ons and after discussions with @baz it was decided that it’s the only way to safely secure the switchgear. Following from this, when drilling the bars, you MUST work out ahead of time precisely where you must drill, because the bars are inline with the forks they screw on rather than clamp on, so there is no option to alter the position in retrospect. So, on to the actual clip-on “review” lol. I’ve got to say I am blown away at the ergonomic improvement this bar setup has made for me. I don’t notice any excess weight on my wrists, but what I do notice is the rider triangle is considerably opened up. This in turn gives more freedom when moving around on the bike and it makes for a more comfortable body position when hanging off and arguable when riding generally. The flatter profile of the Renthal’s do give more leverage in my opinion and coupled with the additional amount of upper body commitment you can supply, makes for a quicker turn in and really helps with chucking the bike about IMO. They also look great on the bike, they’re not that noticeable, but when you look at them in detail they really are a quality part. The only negative, as a road bike (this if of benefit for race/track use), is that there is a reduction in steering lock. This is never an issue when riding down a road etc, but when doing U-turns and/or slow speed tight junctions, it is extremely noticeable and so you MUST proceed with caution or risk dropping the bike (I’ve had several botty clenching moments ...). That being said, you do get used to it and IMO the benefits far out way the negatives. So, to summarise, I think aftermarket clip-ons should be thought of in the same light as after market rearsets, if you gain benefit from an alternative rearset position, I’d say the chances are you’d benefit from an alternate clip-on position. If you are motivated to the change clip-one and most significantly, position, do so with the knowledge that is not a simple case of swapping bars, makes sure you inform your insurance company and if required to do so modify the steering lock. Thanks to @alex for recommending the Oberon Performance bar ends, @baz for the useful discussions on Renthal clip-ons and thanks to Simon at Race Engineering in Essex for, what is always, excellent work. Hope this has been useful and/or insightful? Last edited by Oli; 22nd April 2018 at 07:11 PM. Superb write up Oli, rental clip on's have been on my radar for a while as a desirable mod that's undervalued, don't suppose you could drop me a pm on what it cost to have the work done. One question, would I be able to install HP lever guards on Renthal clip-ons ? Unfortunately no, as the HP lever guards are only compatible with the threaded OEM clip-ons. what's the best place to buy Rental clipons ?